I promised a couple of weeks ago to share the Moose Throw I made. I’ve been having a little trouble with my back, which hurts most when I sit and that makes computering (which doesn’t seem to be a word) one of the more difficult things to do. 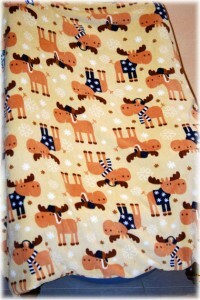 However, I shouldn’t neglect my blog, and so I’m going to share the Moose Throw (which was a BIG hit) and another one I made for another boy this week. 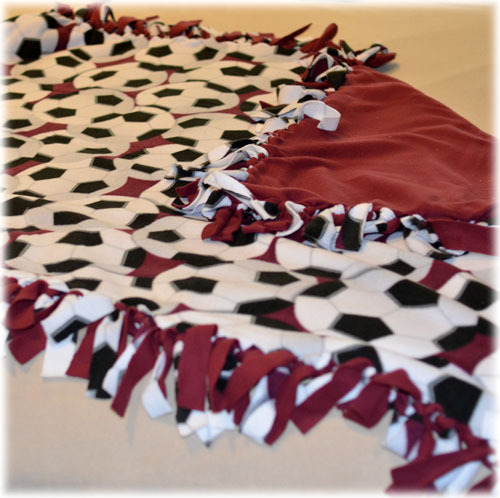 I was going to make one of those tied throws (I’ve seen them called knotted or no-sew throws as well) for my nephew for Christmas. It’s gotten harder to get him something for Christmas as he’s gotten into the teen years and while a gift certificate is always welcome it also seems impersonal. I also wanted to make him something since boys are always a little more difficult to make for and I wanted him to have something from me that he could enjoy. I don’t get to see him very often and I thought it would be nice. When I went to the fabric store I focused in on some really wonderfully soft fleece, in fact it was called Ultra Cuddle and I can’t disagree with that name at all! It was a little difficult to find a pattern that was appropriate for a teenaged boy, however I fell in love with the moose fabric, especially since my brother and his family recently returned from Alaska! It was even better that they were funny, since the recipient loves humor. I chose a dark fabric for the back that matched. Unfortunately when I went to have it cut the saleswoman asked me if I were planning to make a tied throw. When I said yes she said it would be unsuitable as it would fray and shed badly. But I was so in love with the fabric by now that I decided to sew it instead. It was a little difficult to deal with (hard to cut straight, hard to sew straight and big and bulky to manage). However, I was still happy with the final result. I simply sewed it with wrong sides together, like you would a pillow, left a small opening, turned it and hand stitched the last little bit. Not only was I happy with the result, my nephew loved it. PLUS my sister in law apparently is thinking of stealing it. I think I know what I’m going to make HER for some future gift giving occasion! This was seriously easy and I have to say, really turned out great. As for the knotted throw, I made it from a kit I bought. I got a soccer ball pattern because my grandson is an avid soccer player. This was equally easy to make (although I found it tedious to do the cutting). I don’t think the fabric quality was as nice as what I bought for the throw, but by the time it was cut and knotted it seemed just fine. I think you could easily buy fabric and make these up for gifts and raffles and things like that. When you are cutting the fabric the first thing you do is cut the corners of the fabric out (5 inches by 5 inches). I didn’t want to waste those 8 pieces so I pieced mine together and made a pillow with 4 pieces on each side. I didn’t take a photo unfortunately, but I think my grandson will like it. One other thing I did that I almost forgot to mention. When I made the Moose Throw I wanted to add something to identify the maker since it was a gift and so often I make things (especially stuffed animals) and give them away and no one will know in the future that they were made by Grandma or Auntie etc. I am not that good at embroidery and I didn’t think I could hand sign fleece. However I had bought a stamp that was on sale (YES! on SALE!) and it allowed one to put whatever message you wanted in the center and then a circle of design (holly I think, it is a Christmas stamp) around it. I had the bright idea to put a “label” on that. I tried doing one and then “washing” it under running water and soap. It seemed to hold up. 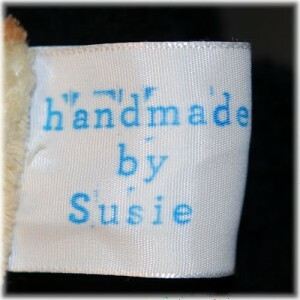 So, I stamped a label on a wide piece of white ribbon I had in my stash and sewed it in. Not a bad idea, altho I think it’s time for me to have some labels made up. I have some dolls that were made years ago by either my Mom or my Grandmother. Sadly I knew who made them when I was given them, but at this point I can’t recall who made which one for sure. I wish they had signed them. Loving both of these throws. I also like the idea of tagging things – at the time it is easy to think that you will never forget but then time gets in the way….. I love that moose throw – who wouldn’t like it? You are so right about signing and labelling – it’s so easy to forget. A reminder for us all, I think. What a great idea for a teenage boy – they still like to snuggle, don’t they! 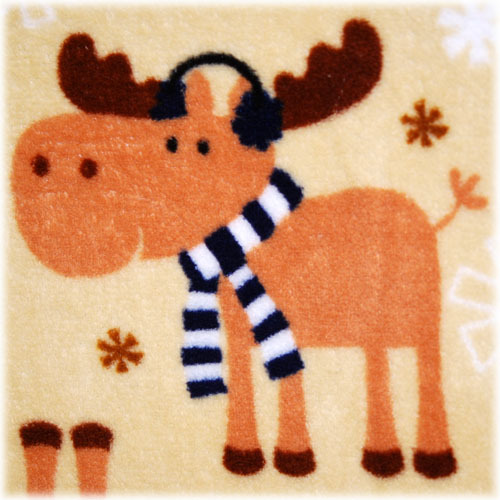 Love the mischievous moose throw – looks ultra warm! Love both of the throws. I have to agree that it’s tough coming up with gift ideas for teenage boys. 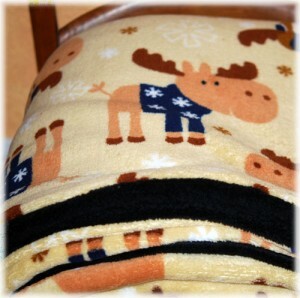 Both throws are great, but my favourite is the moose one. He your back problem improves and that you have a good week. Hello ! It’s so pleasant to see you here ! Wouah, love your creations, and your label is superb ! Very nice idea !